Camps For Kids ages 5-15! Click Here to download a Summer Camp registration form. 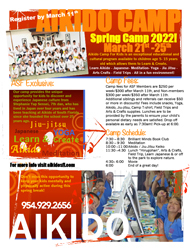 Aikido Camp For Kids is an exclusive educational and cultural program available to children ages 5-15 years old. 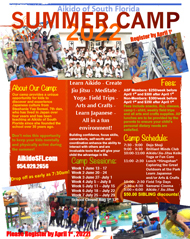 Our camp provides the unique opportunity for kids to discover and experience Japanese culture from Chief Instructor Stephanie Yap Sensei, 7th dan, who has lived in Japan over four years and has been teaching at Aikido of South Florida since she founded the school over 25 years ago. Aikido Camp For Kids will introduce your child to Japanese culture in a fun environment through the training of the wonderful non-violent martial art Aikido, Cooking, Japanese arts and crafts such as origami, Sumi-e (Japanese painting), pottery, calligraphy and making Sushi too! Don't miss this opportunity to keep your kids mentally and physically active during the school breaks! 10:00 - 11:00 Aikido Class "Keiko"
11:30 - 12:00 Lunch "Hirugohan"
*Fridays are our Arts and Crafts day and will substitute the Japanese classes scheduled on this day. Aikido of South Florida's primary philosophy for teaching Aikido to children is to develop each child's own natural sense of self-worth through diligent training and discipline. We work to develop children levels of confidence, respect, and awareness though practice, patience and perseverance. Aikido of South Florida highly emphasizes etiquette and discipline in a traditional dojo environment in hopes of integrating these skills into their everyday life for years to come. The benefits of entering aikido at an early age is to develop a calmer, more focused child which in turn promotes a better home life, better choice in peers, better school interaction and better grades. With the right instruction, children are able to overcome physical and emotional difficulties and begin to learn that the path of the warrior is actually the path of peace. Aikido affords children the confidence and integrity needed to avoid conflict and resolve differences peacefully in a manner that will evolve into something far more important and necessary as they mature. Children are naturally active and full of energy. Our responsibility is to provide traditional instruction to all of our students to develop all aspects of their character. Building confidence, focus skills, camaraderie, self-worth and coordination which enhance their ability to interact with others will prove to be invaluable tools that will give your child the advantage in life. Drop off is as early as 7:30am with the kids wearing their Aikido of South Florida T-shirt and comfortable shorts. Pick-up is between 6:00- 6:30 pm. The Children will be release ONLY to the names provided on the registration form. The school must be previously contacted and informed if any other persons will be picking up your child. Training uniforms, gi, will be needed for daily practice and can be purchased from us for an additional fee at the time of registration for the discounted camp price of $30.00. Although the fees will include snacks for the kids during the day, all lunches must be provided for the kids by the parents to ensure their dietary needs are personally satisfied. The only materials the children will need to bring everyday will be a 3 ring binder to house the work that they will be provided, a pen, a black fine point sharpie, pencil, bathing suit/shorts for when we venture to Young Circle Park. Additional siblings and referrals can receive $25, $50, $75 or more per week in discounts! Bring a friend get $25 off per week. Fees include daily snacks, classes, Aikido of South Florida t-shirt, art supplies. Additional siblings get $25 discount throughout the duration of the camp and $25 off if you get a friend to join! Fees include daily snacks, all classes, Aikido of South Florida t-shirt and art supplies. Camp tuition is due By May 4th and can be made via credit card, debit card or cash only. We can also auto debit your credit card or debit card once a week to ensure timely payment or just make it a little more convenient for you. An additional $50 will be assessed for all registrations and applicants after May 4th, 2015. An additional $50 will be assessed for late payment, insufficient funds or declined funds at the time of debits. As a courtesy to our patrons and participants, Aikido of South Florida has allowed payments to be made weekly as we understand the challenge of making such a large payment in advance. However, although the dues are paid weekly, it is understood that the total amount at the time of registration will be paid in full. There will be no refunds under any circumstances. Non- attendance does not constitute cancellation or release your financial obligation for the weeks enrolled in this agreement. You can receive an additional $25 off weekly fees for additional family members and/or get a $25 credit for each friend you get to join the camp!